Though we were having a grand time enjoying the hospitality in Jasper, Alabama, it was time to move on. We shared breakfast with Gordo and John and chatted briefly before moving the airplanes out of the hangar for departure. Inevitably, our luck with winds changed and the following blurry capture of the GPS in 160AK shows that the cars were now passing us. The tables have turned . . .
Missouri on the opposite side of the river! 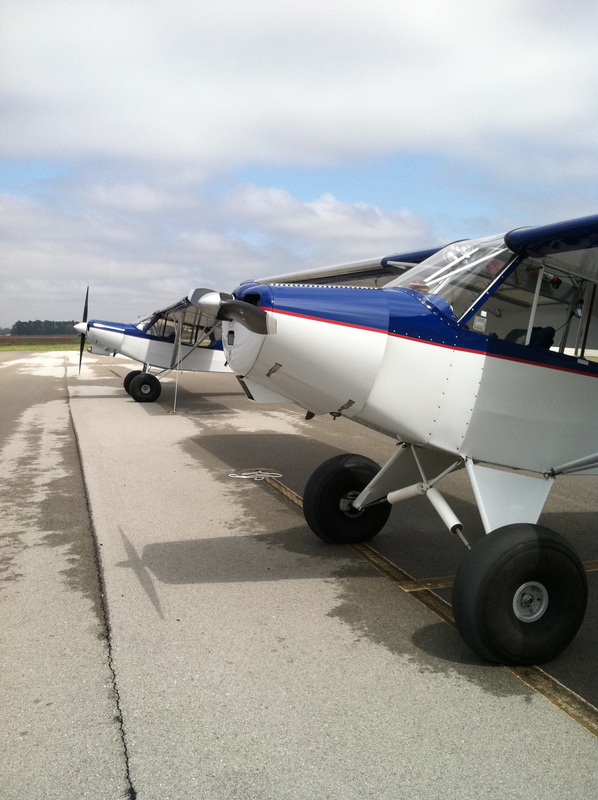 We stopped at County Memorial Airport for fuel and got to see some Air Tractors in action, which was unique because spraying season would not start for us until mid-May at the earliest. We stopped for gas in Kirksville, Missouri, before starting what would be our last leg of the night. 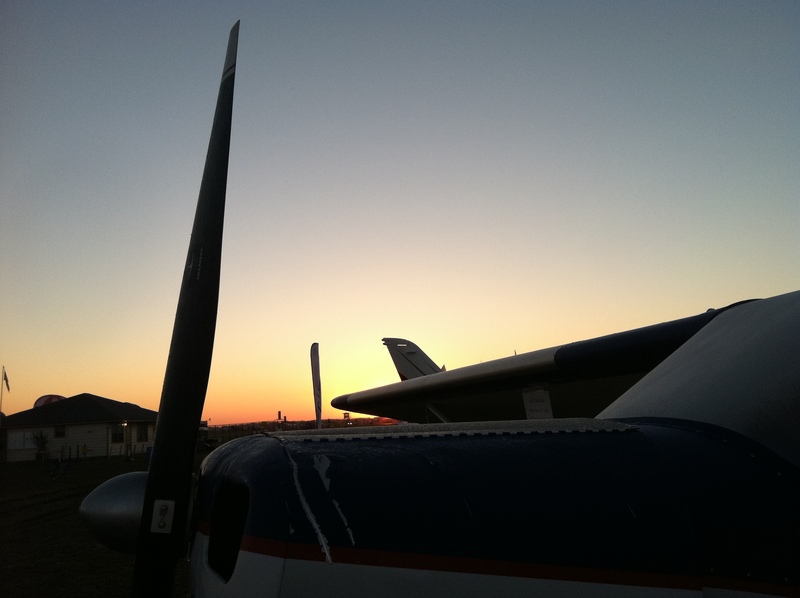 We had made great progress but did not feel like closing out a long day with a night leg, knowing we wouldn’t be finished unpacking and tucking the airplanes away until at least midnight. The evening was about as nice as one could hope for, with smooth air, clear skies, and a beautiful sunset. The fun meter was pegged, and the bear approved! We started hunting around on the GPS for a good place to call it a night. We had had a nice stop in Osceola on the way down, but thought maybe we’d get a little further (plus, we weren’t sure if the gas pump was still having problems). The final leg home to South Dakota would be nice and short compared to the previous days but we’d be rested and fresh having stopped short. 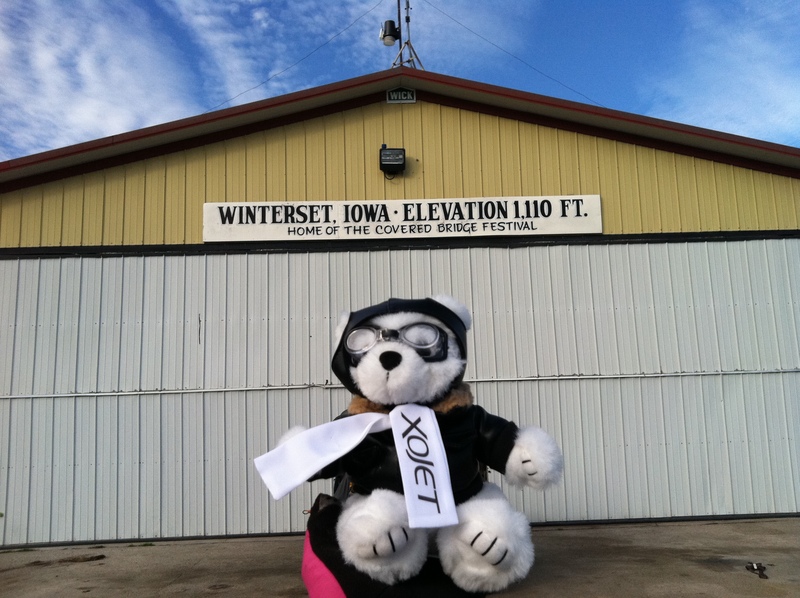 Never having been to any of the airports we saw, we essentially threw a dart and picked Winterset, Iowa. It was getting dark as we arrived in the pattern and since it was 8 pm or so on a Tuesday, the place was deserted. We poked around and found that we had access to bathrooms in the FBO as well as a selection of chair cushions (no couches). There was also a cat that was desperate for attention (we later found out his name was Football, because he bore a striking resemblance to one). We considered departing for another airport after we called and found there was no courtesy car or shower, but elected to get our exercise and walk to town. Armed with the ever-present iPhone, Amy confidently declared which way to go, which turned out to be one of the darkest and most isolated gravel roads around–it even went through a small section of woods for good measure! It was discussed who could run faster, Amy or Dave, in the event of critter attack and all sorts of banjo jokes were made, but the walk wasn’t bad. 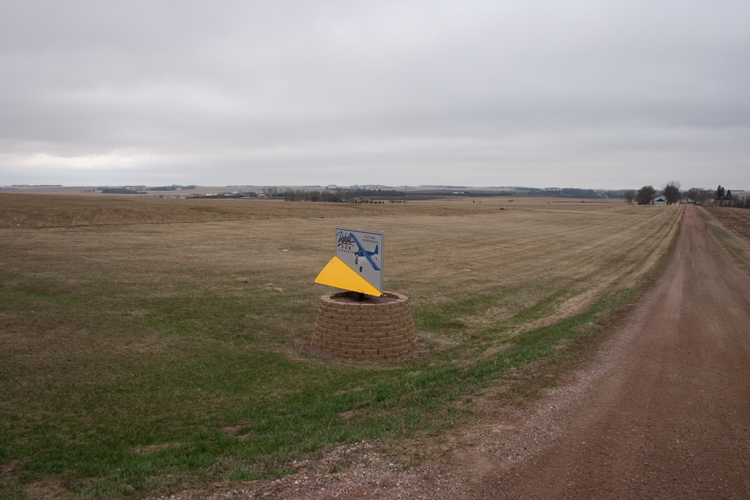 Airnav claims that the airport is one mile north of town. 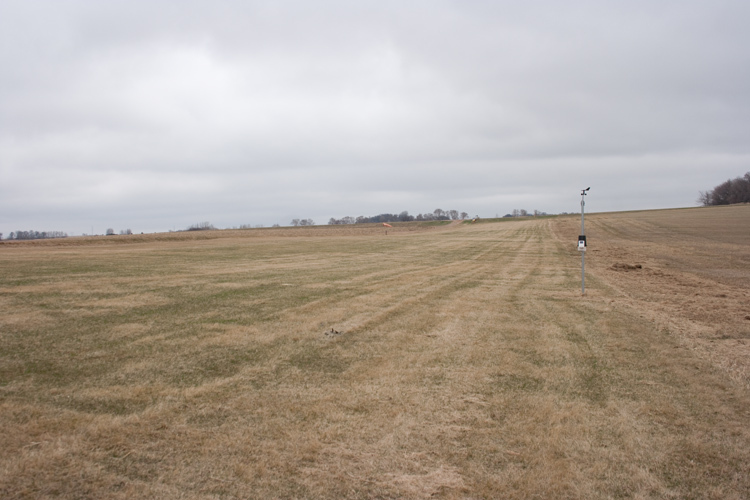 For the record, that is one mile straight-line distance from the southmost point of the airport (in this case, the southern end of the runway). Walking distance was about 2 miles one way. We finally made it into town at around 9:30, but apparently Winterset calls it a night at around 9. The Godfather’s Pizza was closed and while we could have procured a pizza at the local Casey’s, we were hoping for a place to sit down and whine about the walk. The gals at Casey’s suggested Subway, further into town. We started hoofing it further south at 9:46 and Subway closed at 10. With a little pep talk, we were there at 9:52. We ordered and unceremoniously plopped ourselves into a booth. While we didn’t want to hold up the employees, we weren’t quite ready to start the return trip. Around 10:30, we asked the manager and employees if they would be willing to give us a 3-mile ride back to the airport. Unfortunately, they were unable to do so so we began walking northbound. Having had good luck with the friendly gals at Casey’s, we stopped in around 10:45 looking as innocently hopeful as possible. They informed us they were carpooling together but that if we could wait until about 11:15 after they closed up shop, they’d be happy to give us a ride. We happily waited outside enjoying the evening. It was a little chilly but we were relieved to not have to walk again now that we were full and working towards sleepy stage. Upon return to the airport, pilot creativity took over. With no couches and only a few blankets/sleeping bags, we built two makeshift beds out of chair cushions. Aside from the fact that Dave stole Amy’s blanket for a pillow and Football the cat insisted upon visiting Amy incessantly, it wasn’t a bad night (although it was better if you hadn’t gotten your blanket stolen). Morning brought a light, high overcast and light winds. After fueling the airplanes, even that went away revealing a brilliant blue sky that just begged to have some Super 18- and PA-12-shaped holes poked in it. 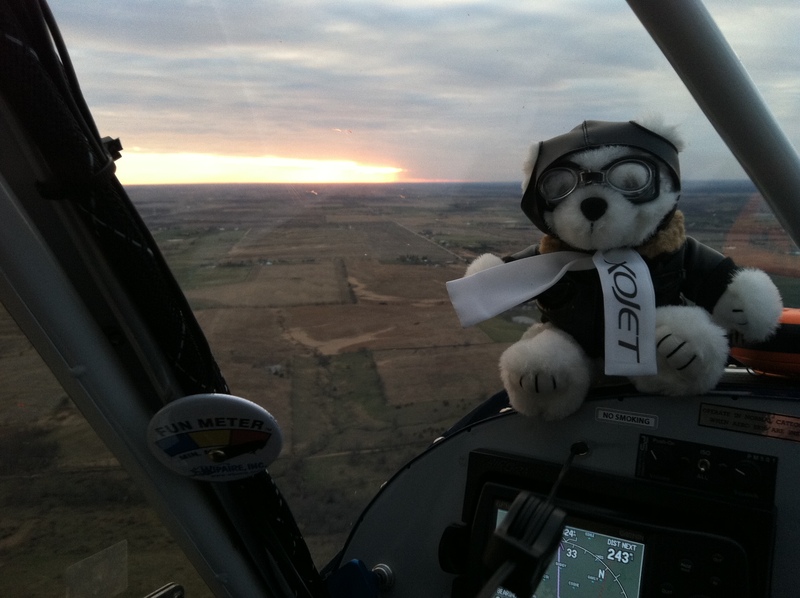 We bid farewell to one of the local pilots and Football the cat and off we went! Winterset, IA is also apparently the birthplace/hometown of John Wayne! The last leg back home was bittersweet. The idea of home, with a familiar bed, was alluring but it seemed the call of the wide-open sky was even more enticing. 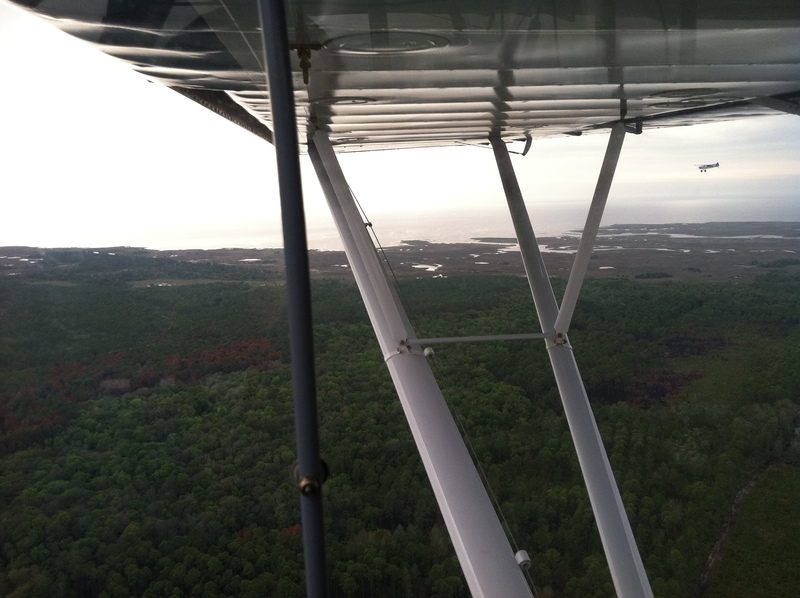 Put two fun-loving taildraggers and their fun-loving pilots together (especially if they’re not picking up the gas tab) and you have a recipe for aimless wandering. Back home was where we would find a two-week backlog of work and school and all those grown-up responsibilities that we pilots prefer to eliminate. Unfortunately, responsibility won this battle and we made a beeline for home (with the exception of two “announcements” at a nearby airport that we had returned). We dropped off the PA-12 at one of our hangars offsite and brought 160AK to DCA HQ. Thus concluded the grand adventure of Sun ‘n’ Fun 2011! Almost never thought we'd see this . . . back at DCA HQ, where the grass wasn't green yet. If ever there was a well-deserved oil change, this was it! Thanks 160AK! The flight there and back took 36.7 hours, and we didn’t even get distracted! 160AK burned 195.21 gallons of 100LL there and back. If you don’t believe weather-dodging can really put you out of your way, consider that 160AK consumed 112.08 gallons of gas headed south and 83.13 gallons headed back north. 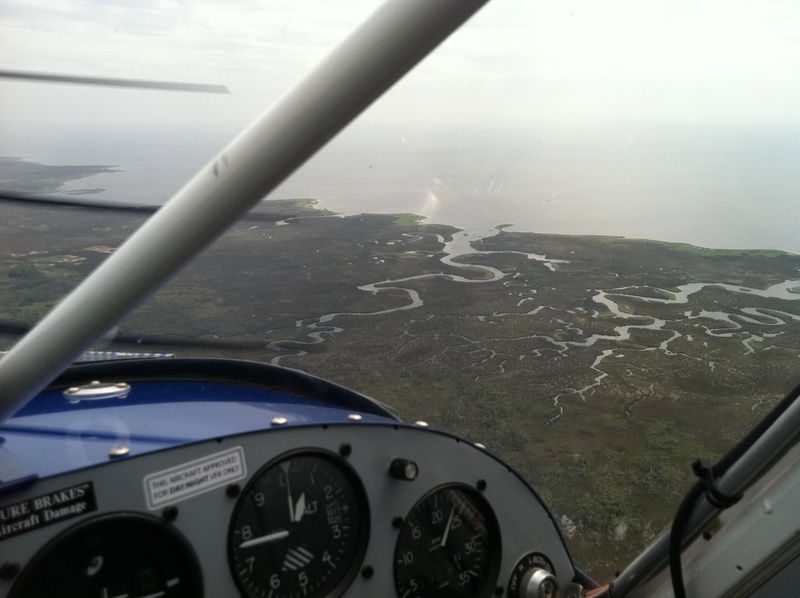 The difference in fuel burned equates to approximately 5.8 extra hours of flying on the trip down versus the trip back. The trip south took six days with one full weather day in Sparta, IL, and almost a full day in Sparta, TN. We spent about half of the day waiting in Decatur, Alabama, and Bainbridge, Georgia. 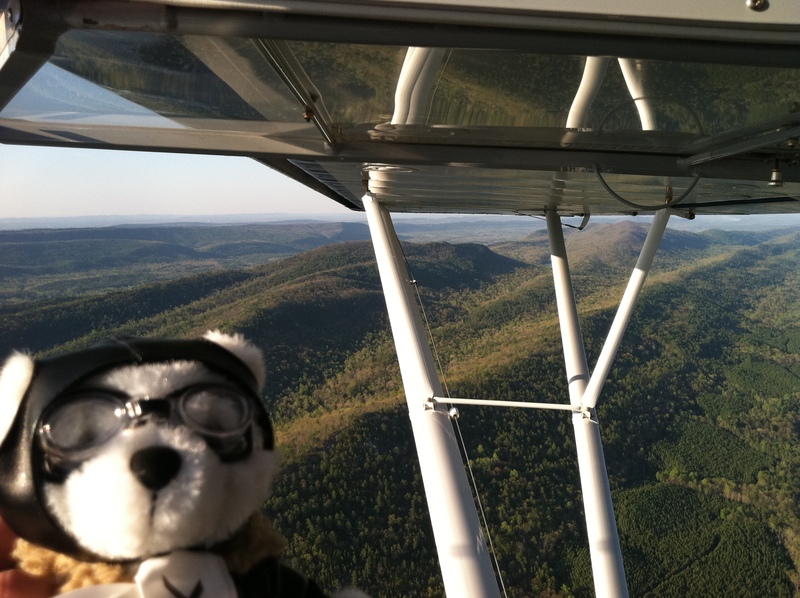 We departed at 9 am on a Thursday and arrived at Lakeland at 7:15 pm on Tuesday (we arrived in Plant City around 4:30 pm on Tuesday but had to wait out the airshow). The trip back home took four days with one weather day in Jasper, Alabama. By some quick math, the average groundspeed was 79.03 mph and the total trip length was 2,900 miles. Most historic: Bainbridge, GA, which was a BT-13 training base in WWII and continued to serve as a training base through 1961. 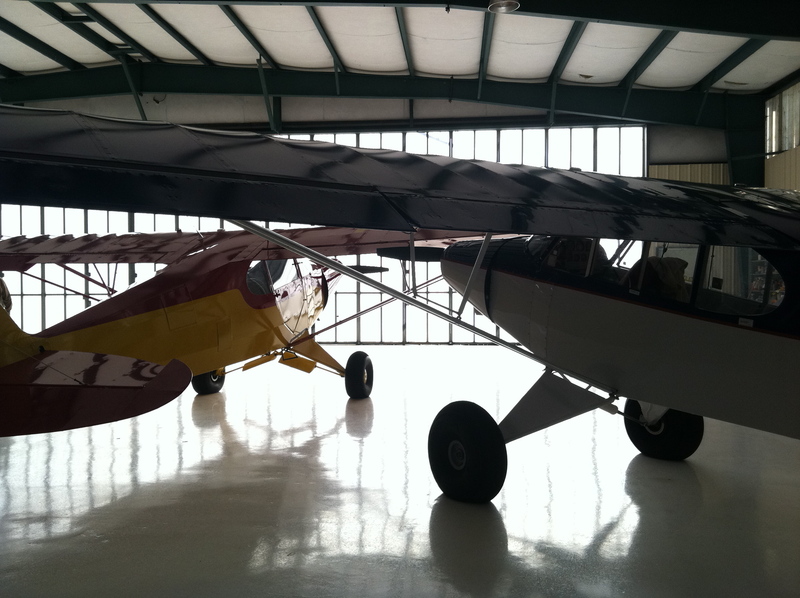 You may recall we had the honor of parking our Super 18s in one of the original hangars for a night. Another note which is rather sad: we met 9 pilots that we flew with along the way. Of those 9 pilots in 7 aircraft, 4 aircraft suffered damage in the storm at SNF, with 2 being totaled completely. It certainly counts as an adventure. After a rather eventful Sun ‘n’ Fun 2011, our team was ready to head home to begin the rebuilding process. We packed up on a beautiful Sunday morning (more irony) to begin the trek home, hoping that the weather would be more cooperative! Pushing 160AK out for departure. 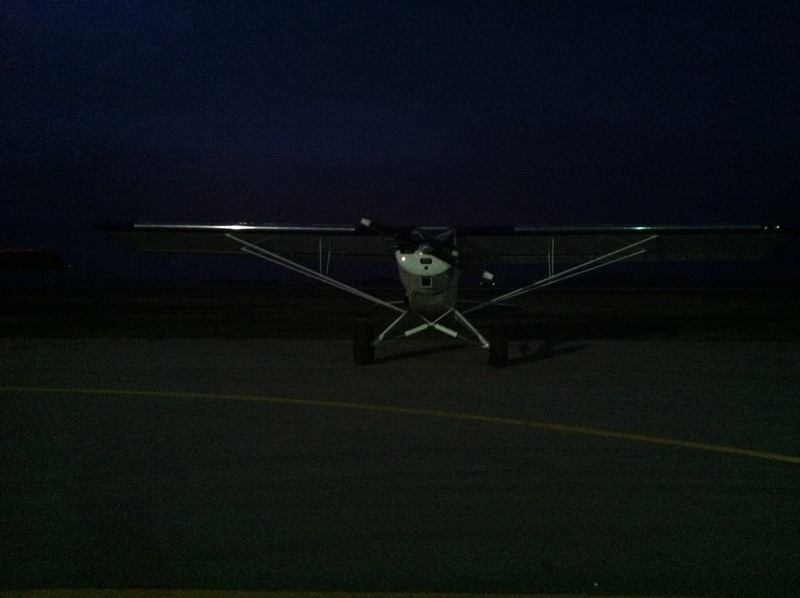 We picked up a beautiful PA-12 that narrowly avoided severe damage from an L-2 that broke loose during the storm. Being wrenched around on the ropes (this aircraft’s Claw broke at about the luckiest time ever, allowing it to fly for a brief second while the L-2 dove underneath) caused the right tank to start leaking as well as the original fuel selector valves and the glass bowl gascolator. The owner decided to send his pride and joy home with us to have our high-capacity gascolator and Part 23-certified fuel selector valve installed. Then, we’d send the airplane off to North Dakota for the fuel tank to be repaired. The weather, you’ll note, was markedly better! Door open, wearing shorts--do we have to leave?? 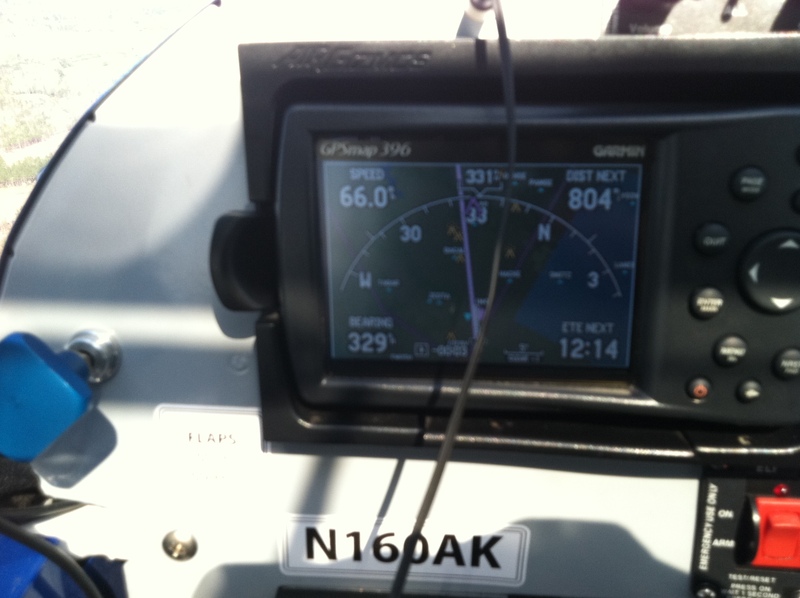 In an odd turn of fate, we even got a tailwind–it’s always a fantastic feeling to pass cars on the freeway! We stopped in Bainbridge, GA, once again to grab a quick bite to eat as the heat and sun were wearing us out. 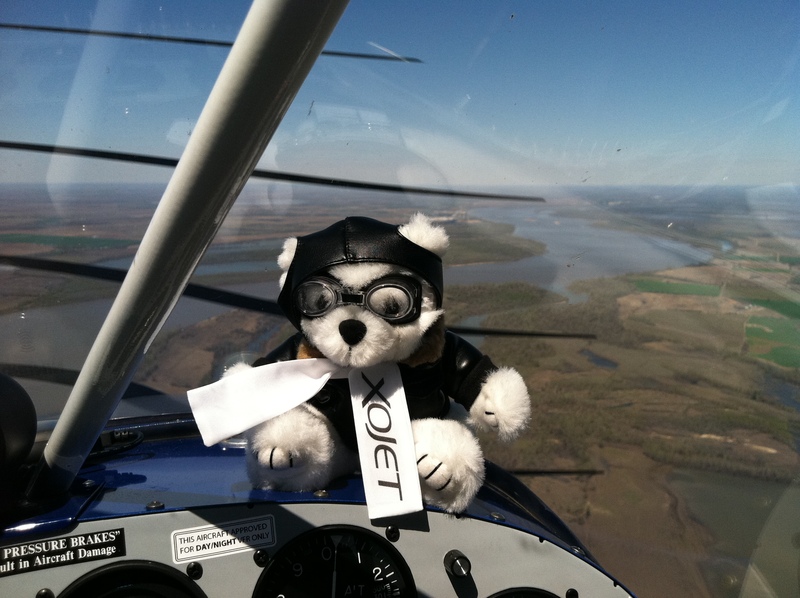 After refueling both the airplanes and ourselves, we were back at it! Our plan wasn’t much of one–we’d punch in direct to DCA HQ on the 296 and 396 and follow the line for 2.5 hours and start looking for a place to land. Scientific? Not at all, but it works well for a pair of Cubs. 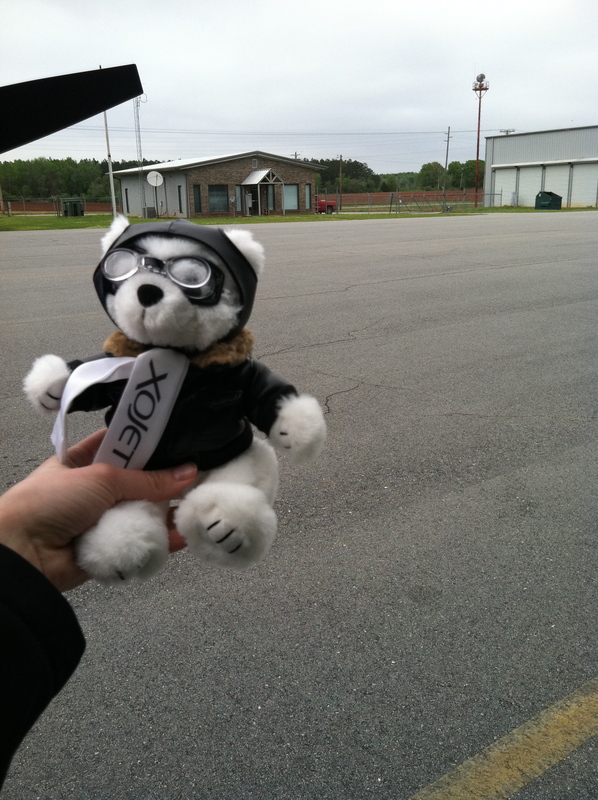 Our next leg found us landing in Jasper, Alabama. It was a little out of the way but Dave had been there before and knew they had self-serve fuel, a 24-hour pilot lounge, a courtesy, and tie-downs. We pondered trying to make another ~150 miles but elected not to after chatting with the pilots of a Bonanza who landed after us. They were Anywhere Map representatives from Kansas who had a pretty good understanding of the weather moving in (and it would beat us) so we decided to play it safe and sit tight in Jasper. We found the courtesy car (a white Cadillac) and headed into town, stopping at a Dairy Queen (Dave has an ice cream addiction that must be periodically satiated) for dinner. We filled the car up on the return trip and set up camp in the FBO on the couches for the night. Jasper does have a shower available (thank goodness) so that was the first task in the morning before the airport crowd from Sanders Aviation began to filter in. We met a good bunch of the gang there, including Gordo, Ryan, Roger, John, and others which escape our collective memory at this time. They were fantastic! The winds were howling up in the clouds (which weren’t all that high) with forecasts for severe thunderstorms to the north and moving in from the south. Given our recent experience with severe storms, we didn’t really want to push our luck and inquired about hangaring our two aircraft. The guys called around for us as the FBO hangar was full and found one of the local pilots who had room. Needless to say, we were tremendously grateful and most impressed! We were then invited to lunch with everyone–the hospitality was unparalleled for sure! Upon return, it was time to wait for the storms to arrive, so we found some chairs and set to getting to know our gracious hosts. By mid-afternoon, everyone had headed home as airport tasks were complete and they were off to batten down the hatches at home for a night of storms. 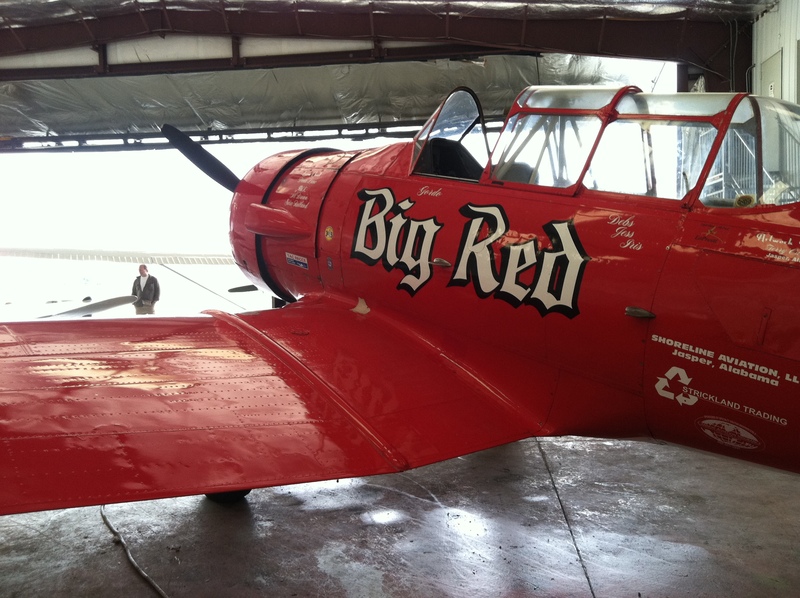 We found a copy of Thunder Over Reno to watch and spotted Big Red, Gordo’s racing T-6, in one of the scenes! But some people didn’t make it very far past the end of the movie . 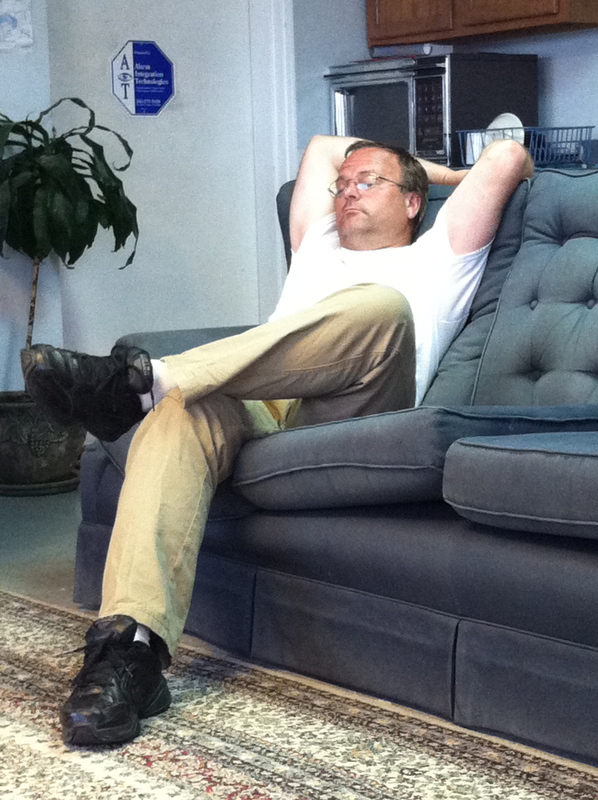 . .
Dave's nickname is "Speedy," but we're wondering if it should be revised to "Sleepy" after this trip . . . Soon enough, the angry clouds started to arrive. Ryan recommended the testing center as a place to sit out the storm as it was built into the side of a hill and had 3-foot thick concrete walls. We followed that recommendation and figured if we couldn’t make it in that building, well . . . 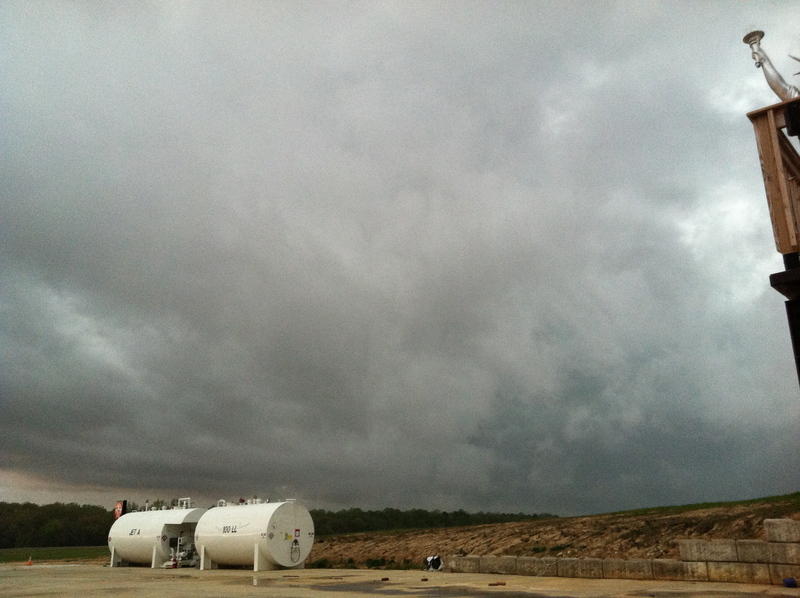 The storm petered out before reaching us but we were certainly happy to have the airplanes safe in a hangar. After some Chinese food, we relocated to the FBO to once again camp out on our respective couches for the night–the weather for the next day looked promising! We may as well title this post “How to break 4 hearts or more in 15 minutes,” because that’s all the time it took for our world at DCA to be turned upside down, literally. This is a copy of the story written by Amy that ran in the May 2011 issue of Airplanista magazine (www.airplanista.com or find Dan on Twitter @Airplanista). 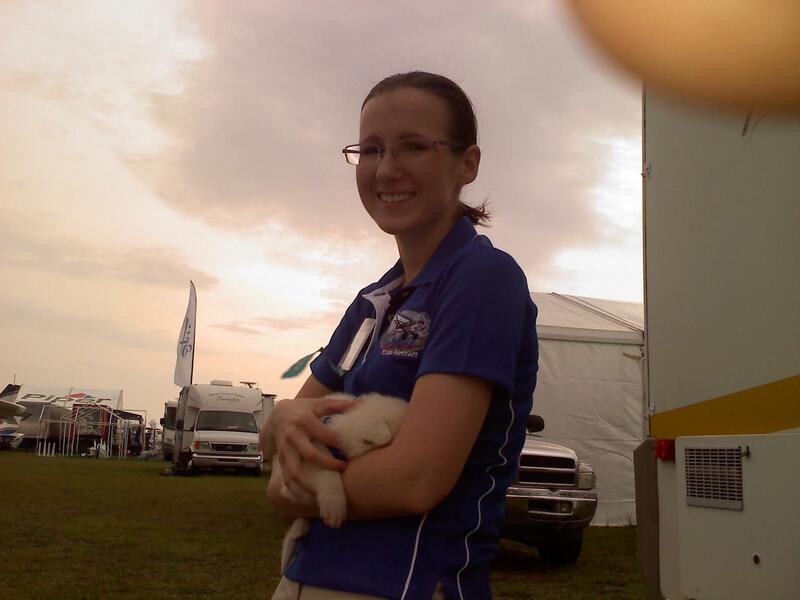 “Thursday, March 31st at Sun ‘n’ Fun 2011 started off innocently enough a security volunteer stopped by to show us some adorable white German shepherd puppies. After reluctantly handing the puppies back, we checked the weather and saw that we needed to check our tie-downs! “We had brought two aircraft with us to display. 160AK, our light-sport eligible kit, and 2300S, our certified 2300-lb gross weight model. We added a second set of tie-downs to 2300S so we had a spiral stake with rachet straps and a Claw with ropes. We did not have a second set for 160AK. “It was eerily quiet as the skies darkened and it started to rain. Then, you could see the trees start to thrash as rain went horizontal and sounded like hail it was pounding down so hard. We had not had time to fully close the awning on the trailer and it ripped off nearly instantaneously with a loud crack. As feared, 160AK pulled the tie-downs out without hesitation and started to roll backward towards the Epic display. 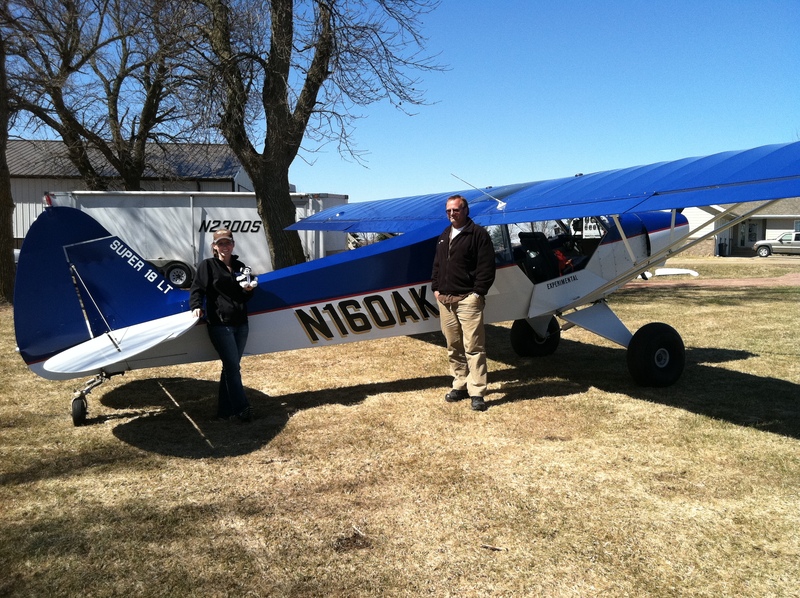 Two of our crew members, Mark and Dave, ran over and grabbed the left strut as the airplane bucked in the wind. “From my vantage point in the trailer, I peeked outside and could barely see 10 feet in front of me. 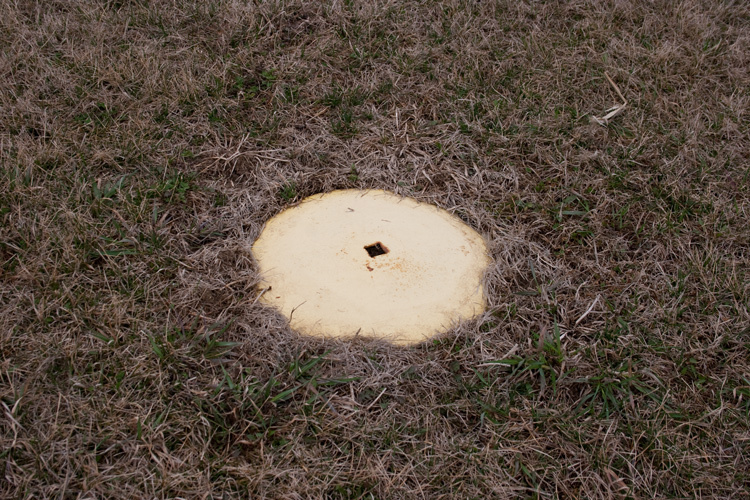 I was looking to see how 2300S was doing and could only faintly see the tail. With little warning, 2300S gave just a slight waggle, and promptly pulled or broke the tie-downs and flipped over backwards, just a few feet from where Mark and Dave were holding down 160AK. “There were a few select words that escaped my mouth and I’m sure I blinked a few times in complete disbelief. But there wasn’t much time to ponder as the wind continued to strengthen—we were left wondering how bad it could get—and Mark yelled for help as 160AK kept pulling backwards. I ran out and wrapped my arms around the lift strut and jury strut and hung on for dear life. At 115 lbs, I’m not a very good anchor in high winds but I was doing my best. “I have never experienced rain like that before. It felt like being underwater, and it hurt! We did get some small hail according to the red marks I later discovered on the back of my legs but it was hard to tell when the transition from driving rain to pea-sized hail took place. When 160AK got light on her tires I clamped down harder and hung all my weight on the strut. I braced as much as I could, up to my ankles in water and sand. 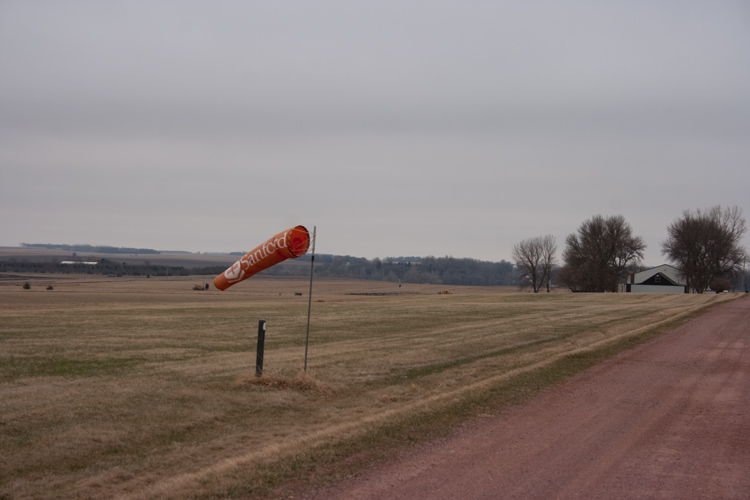 I tried to turn around a few times to see if there were airplanes or debris being blown towards us, but it proved useless. I couldn’t see more than ten feet and you couldn’t breathe. We couldn’t hold 160AK from backing up so Mark knew he had to get the truck—and quickly, before Dave and I could no longer hold 160AK from flying away or blowing into another aircraft. “As 160AK bucked in the wind, with Dave and I stubbornly refusing to let her go, Mark raced to tie the tie-down rope to the truck’s bumper. By the time the airplane was tied to the truck, the wind had started to abate somewhat. What seemed like an eternity had really only lasted perhaps 10 minutes, but the impacts of the storm were much longer-lasting for us and many others. “We could see that everyone on our team was ok, but 2300S was badly damaged and had damaged 160AK as well. 2300S’s tail had hit 160AK’s cowl and dented the nose bowl and baffling. Upon inspection (standing in four inches of water), we were fairly confident we could fly 160AK home but knew we’d have to dismantle 2300S and send her home in a trailer. We were based right along the flight line (the furthest display row forward up to homebuilt parking), and right in the line of greatest severity. With both airplanes pointed nearly straight into the wind (and being taildraggers, they sit at an angle of attack conducive to flight) and nothing to break the wind, we were in about the worst situation we could have been in. Tremendous thanks to all those who helped us out. It means a lot to us. “I don’t think there was a dry eye on our team. 2300S was the prototype aircraft upon which all of our certification testing was done. The certification process was 6 years, 3 months, and 5 days of blood, sweat, and tears—not to mention we had returned the aircraft to flying status only 10 days prior after some off-season maintenance. To say this was heartbreaking would be an understatement at best. “Yet, it’s times like these where the true spirit of aviation shines through the brightest. Within minutes of the rain ceasing, complete strangers were offering to help and my phone was buzzing nonstop with offers to help from friends and Twitter users alike, and hugs abounded. Everyone banded together to help out, which truly warmed our hearts. Obviously, we couldn’t do anything that night as the grounds were closed for cleanup, but we were given a ride to a nearby hotel for the night. The next morning, we had a small army of people helping us dismantle 2300S and trailer the pieces off-site until we could be in touch with the insurance company. 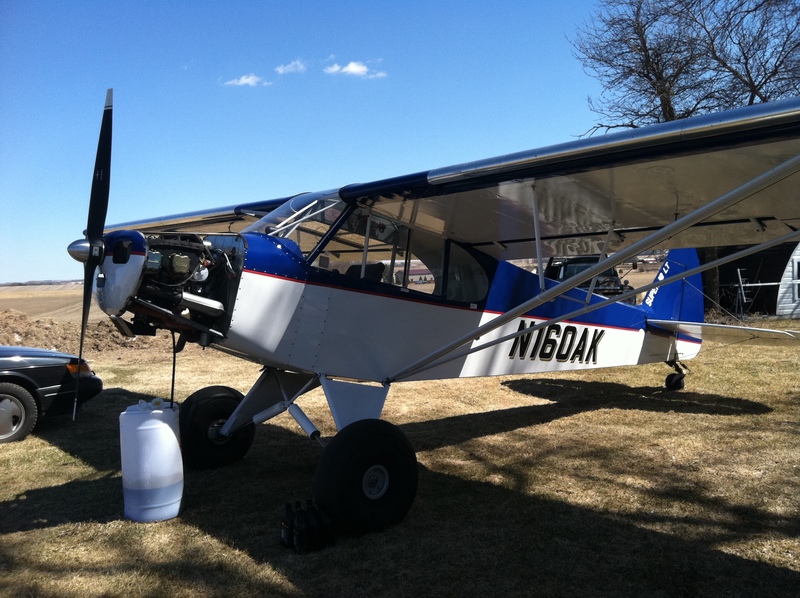 We even had an offer from our friends at Legend Aircraft to borrow a prop for 160AK. We didn’t need to take them up on it, but we have been truly lucky to have the greatest friends out there. All of you almost assuredly know of the storm that tore through Lakeland and damaged or destroyed approximately 70 aircraft. But, let’s hit the high points before we get into the carnage, shall we? Dave and Amy along with intrepid adventurer Jim Lawrence FINALLY made it to Plant City on Tuesday, March 29th at approximately 4:30 pm. Jim really deserves a perseverance award for sticking with us for the entire trip–he almost had to drop out to make other obligations but stayed with us to the end! 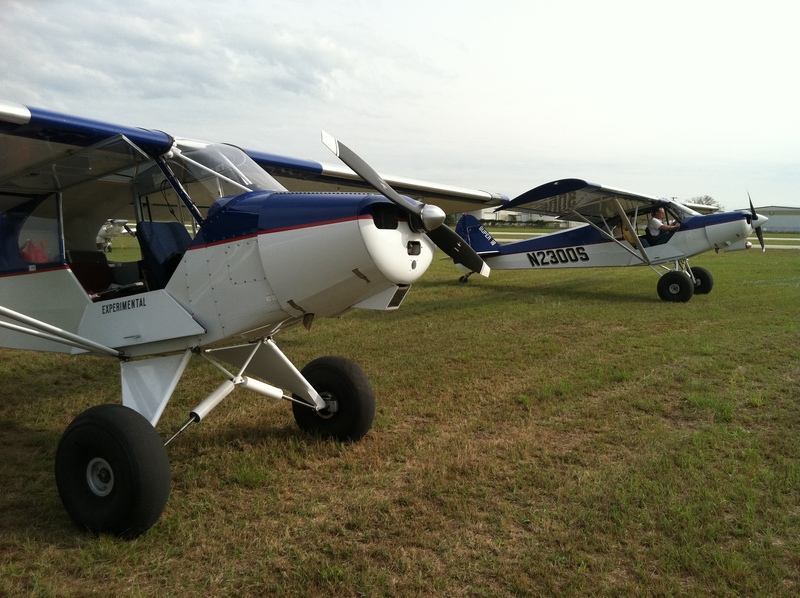 Upon arrival at Lakeland (by the way, there’s nothing like hearing the tower saying “Blue-and-white taildragger with the big tires . . . ” and wondering WHICH ONE?!? 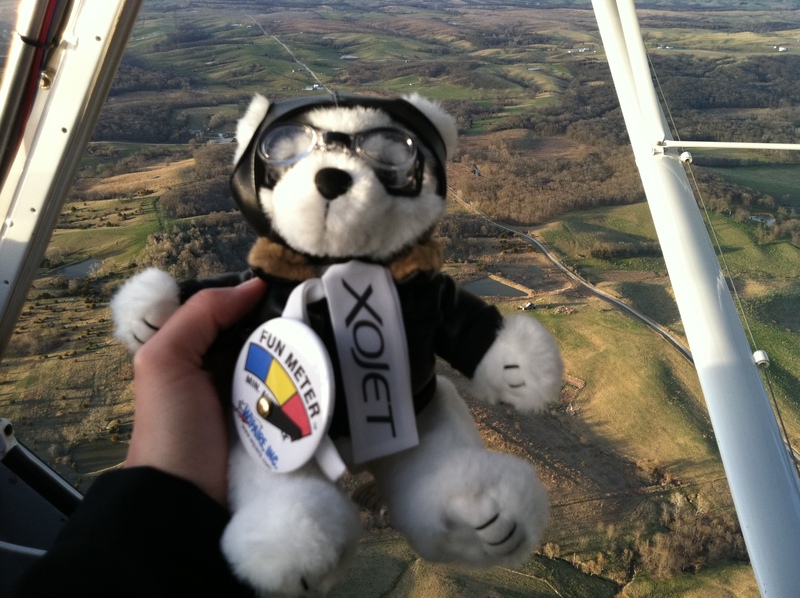 ), the DCA crew quickly tied down the airplanes in our booth and then we were off to catch the Cub Convoy dinner. Amy had coordinated the Convoy and was disappointed when weather did not allow the Super 18s to participate in the arrival–but was pleasantly surprised to make it to the dinner at least. The Convoy crew thoroughly embarrassed her by delivering a standing ovation. Dakota Cub was a proud sponsor of Cub Convoy 2011 and sponsored the tent rental for the dinner. A good time was had by all DCA team members! After the socializing, hugs, and the obligatory comments of “You finally made it!” it was time to make camp . . . sort of. After 6 days of 5 am wake up calls and hours of waiting for the weather to clear, the DCA crew, especially Amy and Dave, were pretty exhausted. The plan became to put Dave in the camper with Mark and Keith and then have Amy set up camp or sleep in the truck for the night. 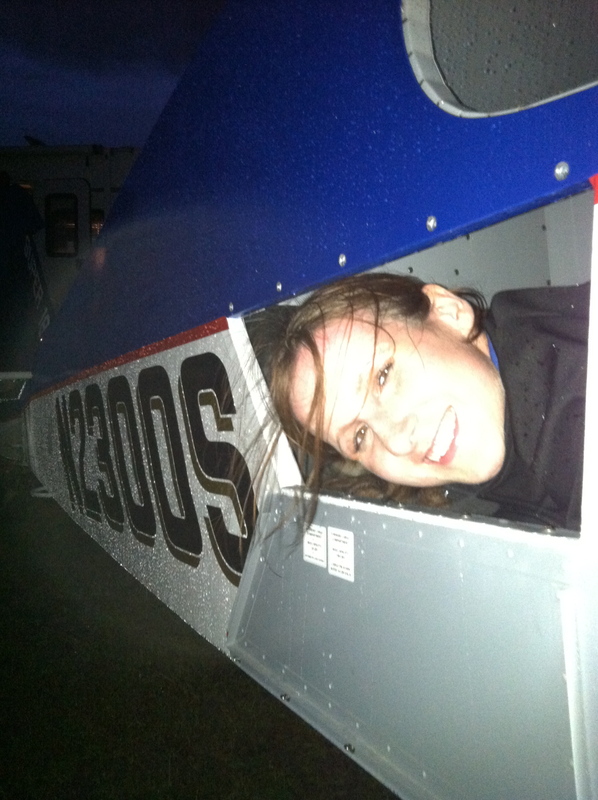 In case you haven’t noticed, intern Amy is a little on the wacky side, so she enthusiastically decided to sleep in the baggage compartment of 2300S. Apparently, it has been something she has been tempted to try for quite a while. This was night #2: apparently it was so comfy she decided the tent was unnecessary! Wednesday reminded us that Sun ‘n’ Fun really did live up to its name. 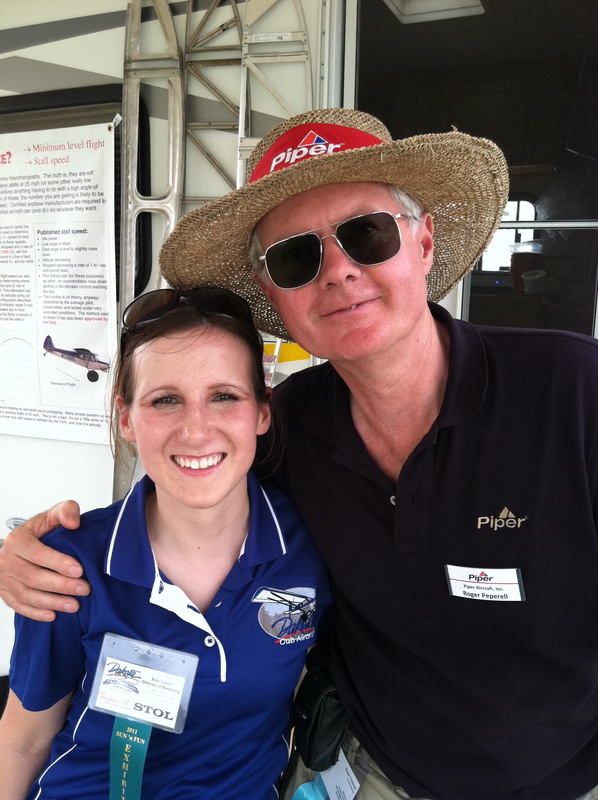 Amy did an interview with Sun ‘n’ Fun Radio about Cub Convoy 2011 and a friend Dave made at Lock Haven 2011 stopped by. Roger Peperell literally wrote the book on Pipers (titled “Piper Aircraft”) and rode along in 160AK when at Lock Haven. We were pleased to see him again! Wednesday wrapped up with some rain, making us wonder if we had had our only glimpse of sun and fun. Despite the light rain, we transitioned 2300S to a drool-worthy set of new 31″ Alaskan Bushwheels. One down . . . one to go! Thursday brought clouds and thin crowds–but we got a visit from a security volunteer who had puppies (Amy was in love at the word “puppy”). Cell phone photo--but you get the idea. Adorable! Of course, Thursday was the day the storm went through. As many of you know, we lost 2300S after the tie-downs broke. 160AK was damaged when 2300S’ tail hit 160AK’s side cowl and nose bowl. An account of that story was published in the May 2011 issue of Airplanista magazine (www.airplanista.com). We’ll excerpt that story later to keep this post shorter. The morning after the storm. 160AK looks like she tangled with a bear. The rest of the week was spent recovering from Thursday, a process in which we were once again reminded just how fantastic our aviation family is. 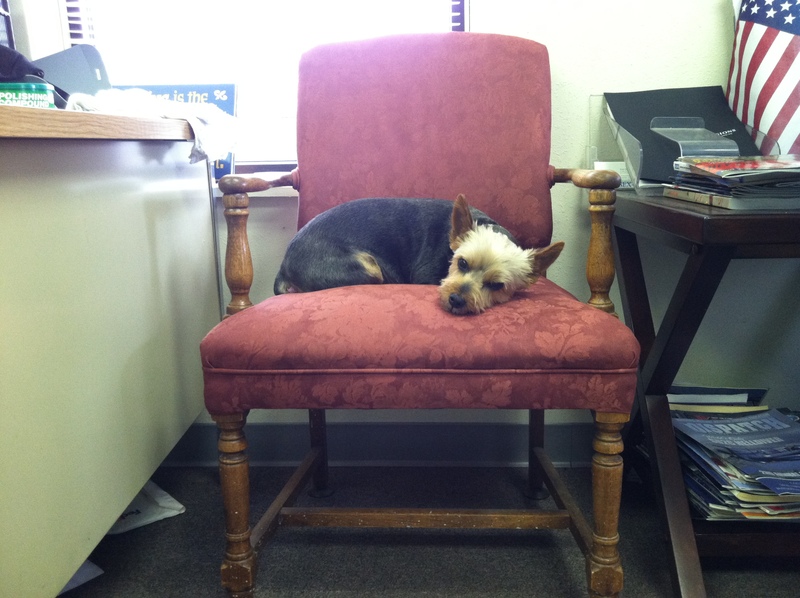 We were truly touched by the assistance from all of our longtime friends as well as some new ones. We closed out the week with our chins held stubbornly up, refusing to let the aftermath of the storm break us. 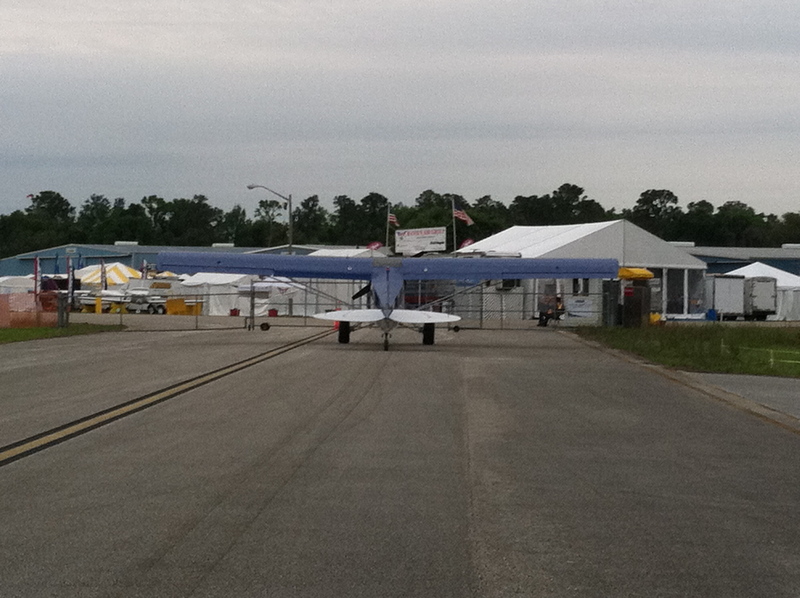 Thanks to everyone who stopped by to visit us and we look forward to seeing you all at Oshkosh! We’ll be in booth #270 all week long. 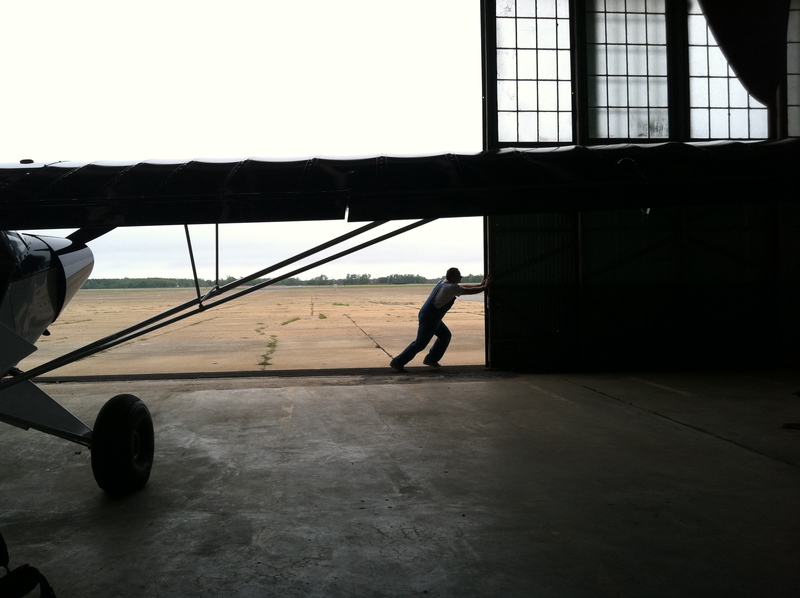 We had to swap airplanes from our facility in Valley Springs to our hangars at another airport. Of course, we can’t just go from Point A to Point B (because that would be boring, and our attention spans aren’t that long), so we got an impromptu airshow and thought you might enjoy this capture of 230AK. Hope to see you at our open house on June 8th! 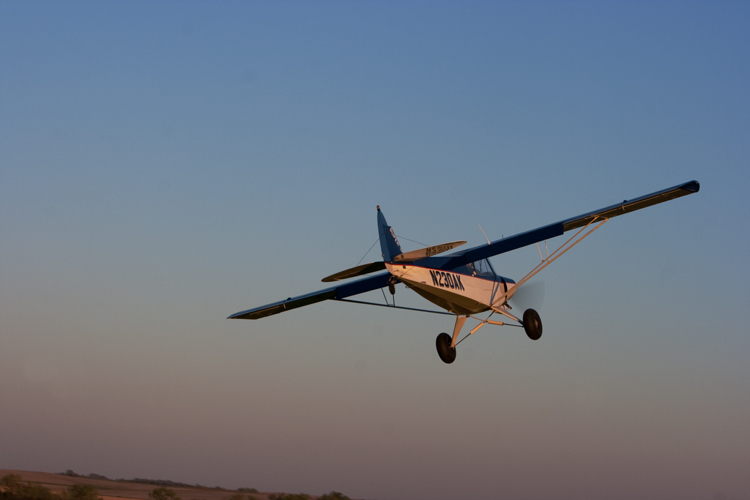 For those of you headed west to the Missouri Breaks and Johnson Creek fly-ins, Dakota Cub is hosting an open house on Wednesday, June 8th. 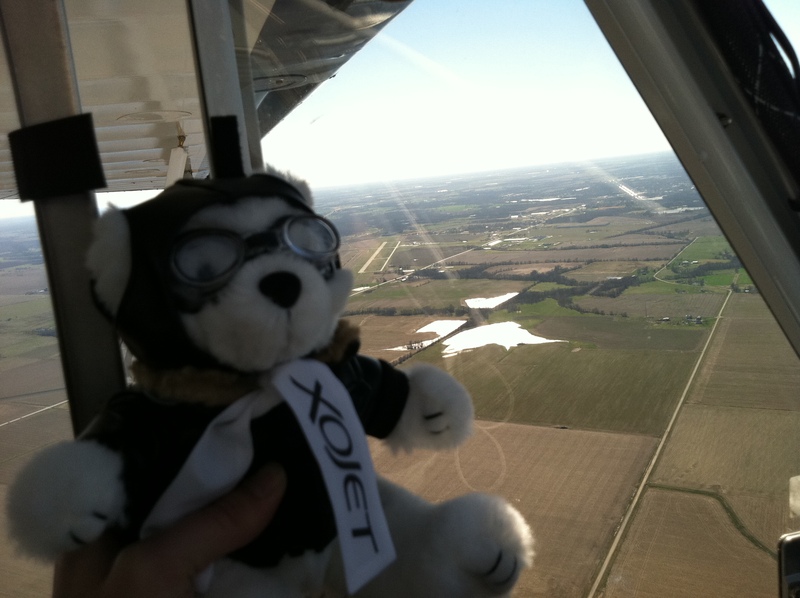 Of course, you don’t have to be a Super Cub pilot/owner or headed to the Breaks to stop in! We have scheduled the open house for a Wednesday around the Breaks fly-in and Black Hills Round Up so that DCA HQ can act as a stopover point (food and lodging) for westbound pilots. P.S. We promise it’s greener now! We have good news and bad news here at DCA. Bad news first, like pulling off a Band-Aid (go quick! ): The bad news is that raw materials costs have steadily been creeping upward and it’s come to a point where we need to reevaluate our prices which will result in an increase. We hate to give you that news because we don’t like raising prices any more than anyone else, but it has become time. We will be examining our price structure on or before May 15th (previously May 1st) to determine how much we’ll be forced to raise our prices due to materials costs. Good news to cheer you up after that: The good news is that we’re offering a 12% discount on all wing orders placed by May 15th! The discount extends to all varieties of wings–slotted squared wings, squared (non-slotted) wings, and standard round tip wings, with the exception of buffalo or barbeque wings. While you’re here, check out our STC Showcase section (in “Categories” on the right side of the page), specifically this article on why are wing ribs are the best in the business. As always, stay tuned for more, including more Sun ‘n’ Fun recap (and let us assure you, it was an experience)! Edit 04/27/2011: Discount extended through May 15th. Don’t get us wrong, we were still having fun on our lengthy cross-country, but we were looking forward to actually arriving. It was now Tuesday morning, and the ceilings were too low (300 feet as we recall) to set out right away. We invited our fellow stranded pilots into town for breakfast but found they were even better-outfitted with food than we were (fresh milk, rice krispie treats, red vines, homemade chocolate chip banana bread, etc.) so we headed back for food. 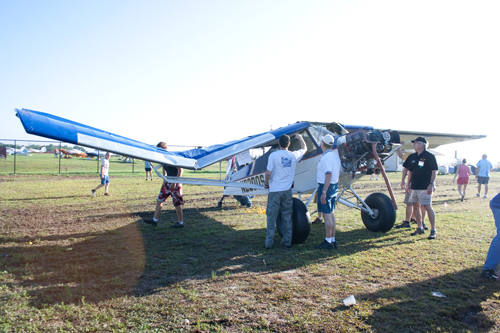 Once the ceiling picked up enough, we followed the Magnum and Citabria out (gave them a half-hour head start in case they hit weather and turned back). After half an hour of low ceilings (only one low patch that made us think twice), we popped out into an utterly gorgeous day! Sunshine--and the Gulf of Mexico! Things just kept getting better, until we had blue skies peeking through a high scattered cloud layer. Suffice it to say, it was tremendously rewarding to see that! Where in the world are the Super 18s now? PLANT CITY!! Granted, we arrived at Plant City 30 hours after the Cub Convoy had taken place, but by God we had made it! 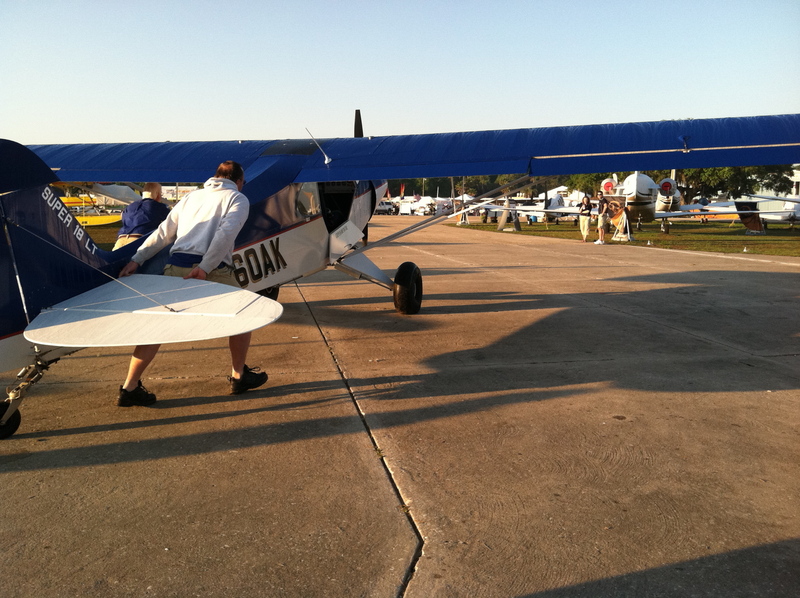 We fueled up and waited for the airshow to conclude to head over to Lakeland. In the meantime, there was nothing to do but enjoy the warm weather, watch airplanes, and talk to airplane people. Life is rough somedays . . .
A beautiful sight--moving the airplanes into the exhibit! 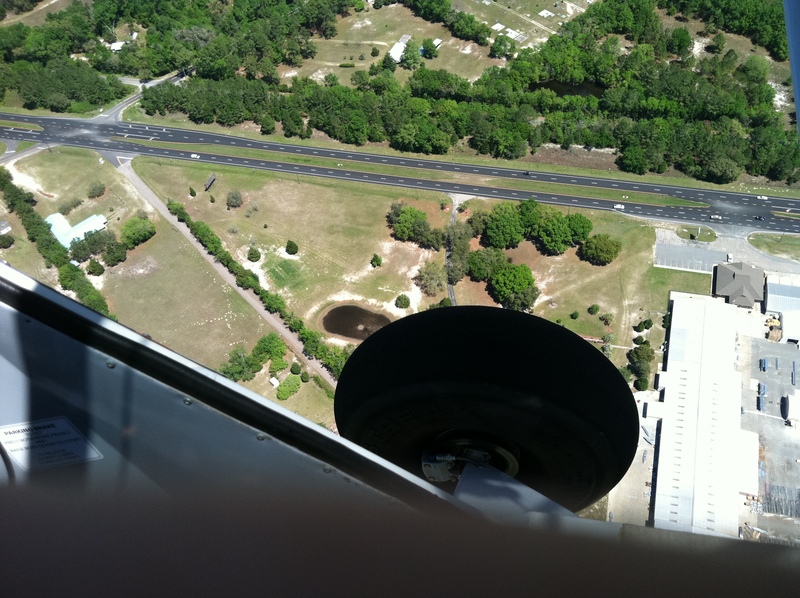 The flight over to Lakeland was a nonevent–the skies were calm and we hardly had any other traffic to worry about. It was almost unbelievable to think that after 6 days we had finally made it–but we didn’t have too much time to ponder. It was on to the Cub Convoy dinner and then to unpack! We’re obviously a little behind the curve here, but it has been a whirlwind couple of weeks. We had a nice night in Decatur, AL, with some of the finest hosts you could ever ask for. Stan and Ben picked us up at the hotel (and made sure we got the discounted airport rate) at 7 in the morning with smiles, even after a late night loading freight. They graciously hosted us at the airport and Stan’s wife even supplied food for us stranded pilots. 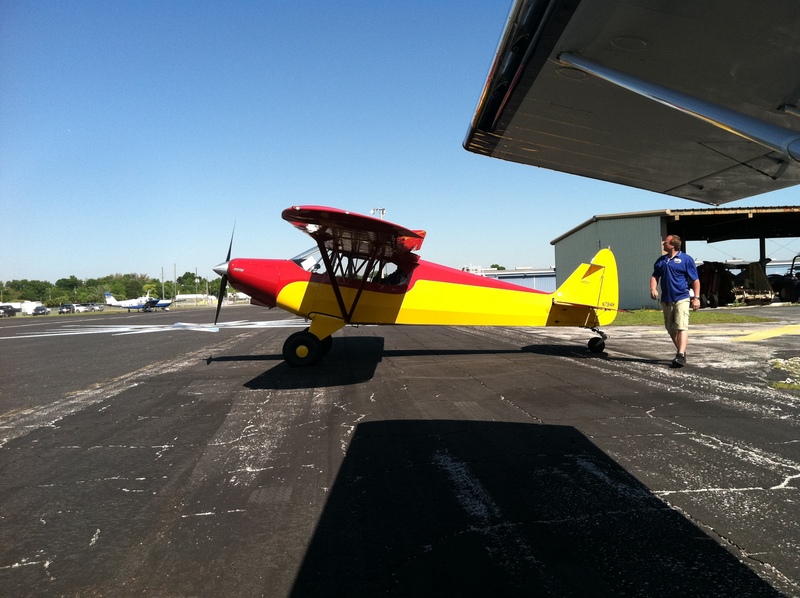 We were joined by “Dead Eye” John with his L-19 as well as a fellow delivering a PA-12 for restoration. BLUE SKY! We had almost forgotten what it looked like. After grabbing a quick bite from our gracious hosts, four airplanes with five pilots eagerly fired up and headed for the runway. Ben followed us down the taxiway to get photos as well. Dead Eye was ahead of us in the faster L-19 and called back to give us pireps along the way. He advised us the ceilings over the ridges were good, but that we might hit low ceilings/visibility further along. We ended up turning south due to dropping ceilings (and IFR conditions at our intended fuel stop) and stopped in Early County, GA to regroup. 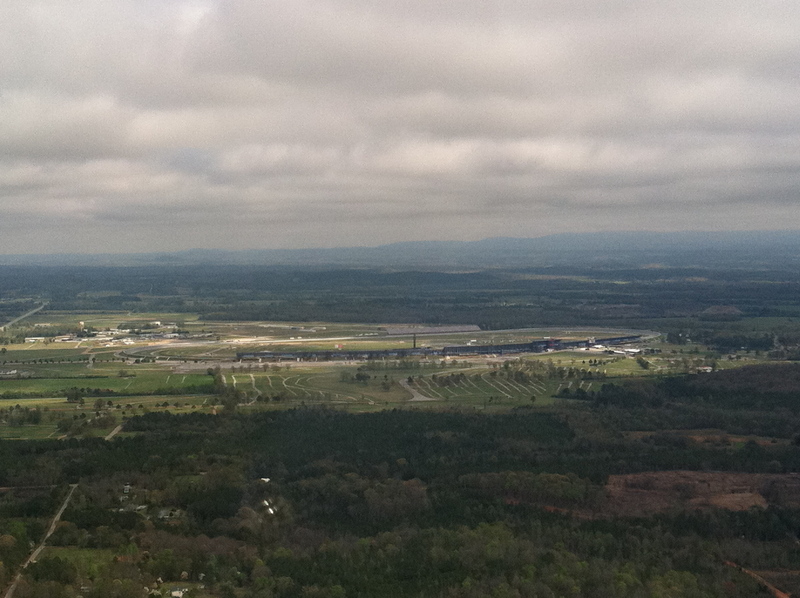 There was no fuel in Early County (which we knew) so we quickly looked at the map and decided to head approximately 30 miles south to Decatur County (yup, another Decatur), GA.
We flew past the Talladega Speedway on the way south. 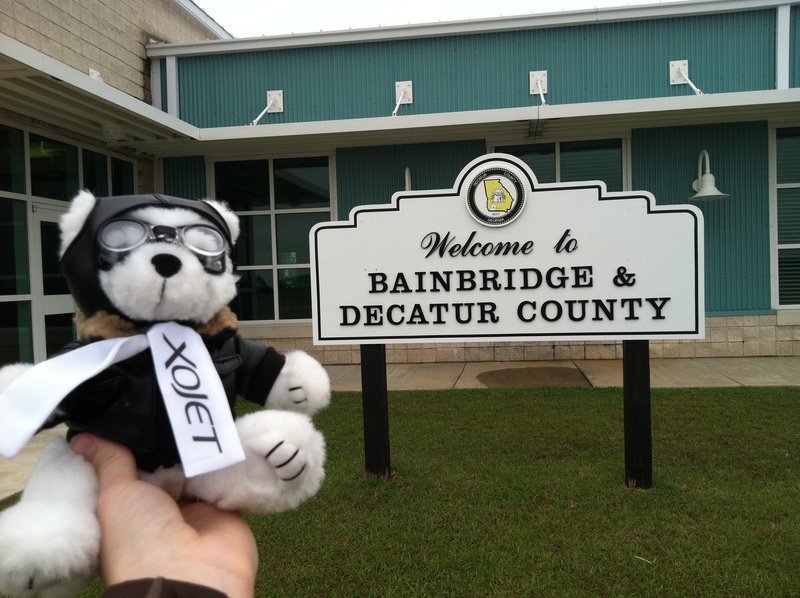 Quick stop in Early County to re-plan, then off to Bainbridge, GA! 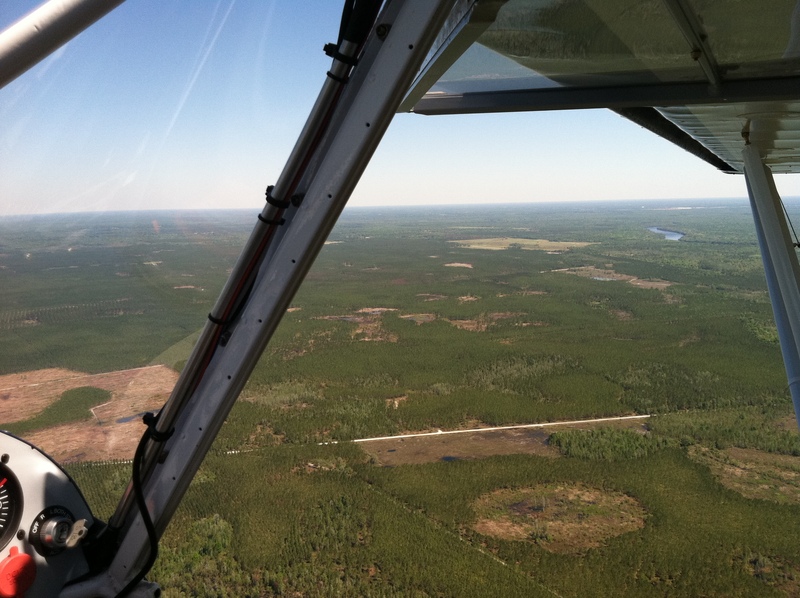 The flight to Decatur County (Bainbridge, GA) went well–much better than our trek further eastward was looking. We landed to get fuel and found the airport to be quite interesting. BGE was built as a WWII training base and had a fleet of BT-13s based there. The airport was used for training for decades after WWII (we later read in a magazine in an FBO lobby on the way back–stranded again–that training was done in T-37 Tweets later on), but has long been out of service. The sectional still show the parallel runways (14/32 and 9/27) plus the decommissioned 3/21. While it is sad to see the runways closed, they’re really not needed (although you could land on them in an emergency). 9/27 and 14/32 are in great condition with lighting. The ramp is massive and if you close your eyes you can imagine dozens of cadets heading out to their BT-13s in the sweltering Georgia summer heat. Here we are! Beautiful new building with friendly people. There was the chance of some weather moving through so Tony invited us to move 160AK and 2300S into the hangar for the night with an Avid Magnum and a Citabria Explorer (also stranded, SNF bound). 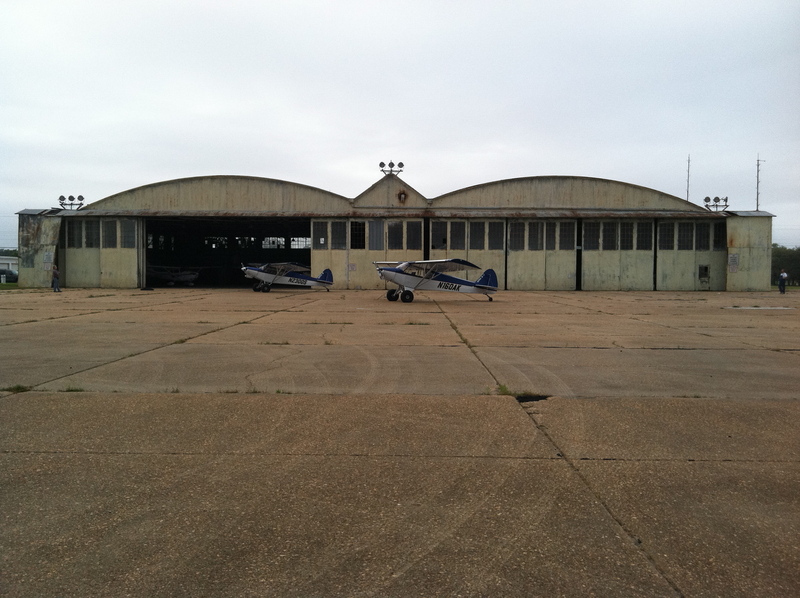 Our airplanes got to spend the night in one of the original WWII hangars! As you can see, the hangars at BGE are in a bit of disrepair–the structure has held up quite well but no maintenance has been done in years. It’s sad to see that the county managing the airport has not put any money back into preserving the pieces of history on the airport, but still good to see them investing in the future of the airport in runway resurfacing and a new terminal. There is still something sobering about hearing birds flit through a mostly empty hangar and hearing their chirps echo through the vacant space as you let your mind wander to the history that took place there. They don't build them like they used to--these 65-year-old doors still slide smoothly. 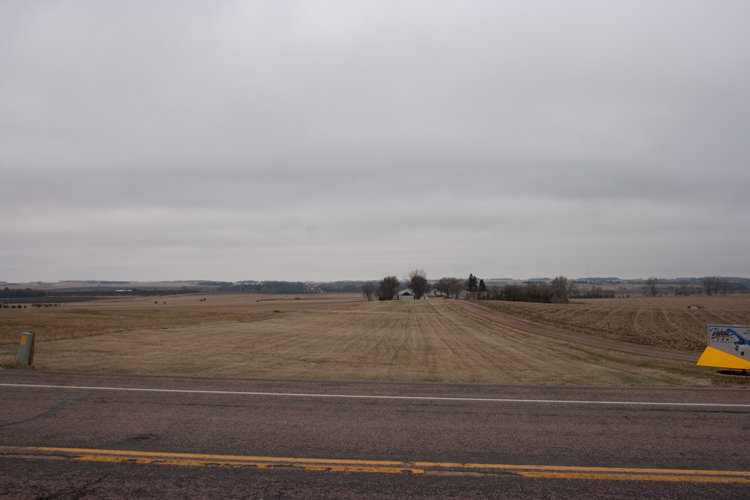 We thought about trying to make another 130 miles (ish) to another WWII airfield, Perry-Foley. The other pilots we talked to had decided to call it a night in Bainbridge, and after discovering the temperature/dewpoint spread in Perry, FL was 0 degrees, we elected to stay the night too. We knew we had a courtesy car and a hangar in Bainbridge but weren’t sure if we’d have the same in Perry, let alone the concern of ground fog. Yup, another night in another Decatur! We were hoping we’d have better luck with Decaturs than we had with Spartas. More to come to fill you in! To answer the first question that will likely pop into your mind–no, we are not stuck in another Sparta. We woke up a little later and meandered out to the airport a little more leisurely, knowing the weather wasn’t good enough to go. We poked around a bit, chatted with some folks taking a Citation to SNF, and then settled in to our now-routine habit of airport BS’ing. 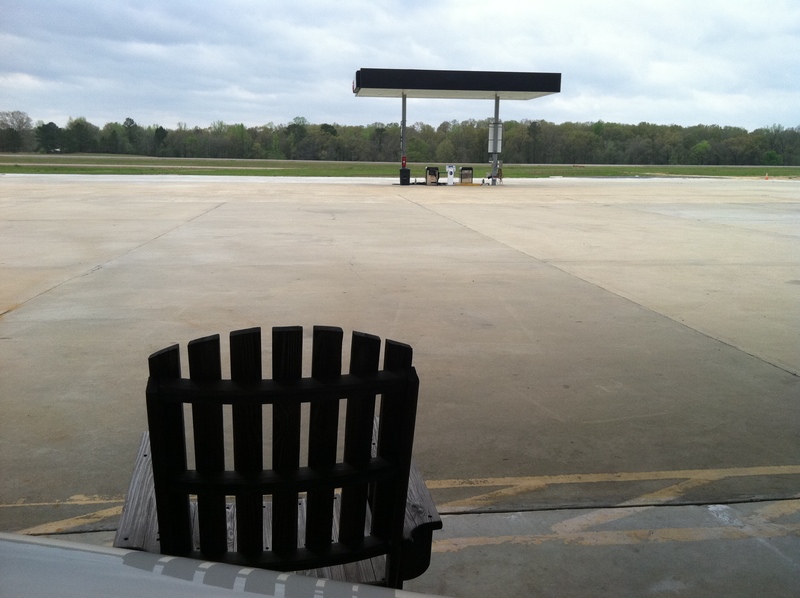 The folks over at the Upper Cumberland Regional Airport (SRB) are a fantastic bunch of people. A couple of Cub pilots really couldn’t ask for more–they opened their hangars and facilities to us with open arms and went above and beyond their responsibilities to accommodate us. We even had an offer to stay in the crash pad (which was actually quite nice) of one of the wonderful guys there. It was tremendously difficult to turn down–but progress is progress, and we had a little window to move south. After a personal pirep from a contact flying a Porterfield down, we decided not to head straight south even though the locals thought it might work best. There were pros and cons to both ways, but we elected to head west, then south. 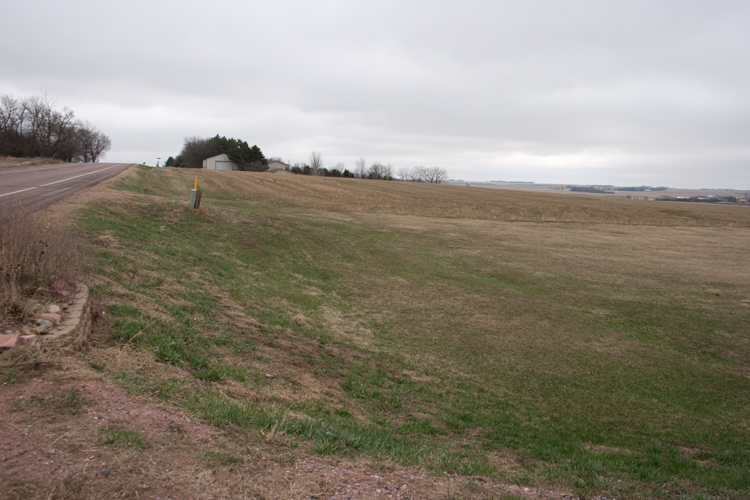 We had a short leg to Maury County (MRC) which we turned short of to follow the highway south. Noticing IFR conditions being reported further south (Folsom, AL), we landed early in Decatur, AL, right outside Huntsville. It wasn’t much of a leg, but we got somewhere. Continuing the trend of fantastic people, Stan and Ben at the Decatur FBO have been superb (running out of positive adjectives). They both offered to drive us to a hotel, set us up with an airport discount, took us to dinner, and agreed to pick us up at 7 am tomorrow (as well as three other pilots, all SNF bound). If you’re in the area, stop by. The facilities are beautiful and the service top-notch. We’re not sure where we’ll head tomorrow. It’s supposed to be nice here (relatively) but there is still a line of thunderstorms that we need to get across/through before we can get to Lakeland. Cub Convoy is being hit hard by the weather. 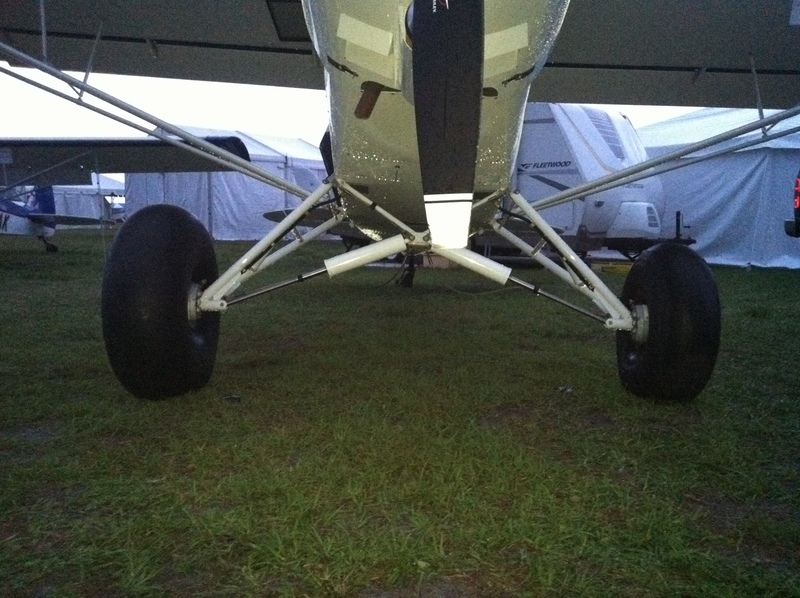 With over 40 aircraft registered, only 6 were present at Plant City as of 6 pm tonight. We’re hoping a few more Floridian Cubs can make it in but it’s anyone’s guess with the weather over north Florida right now. Everyone has been great in stepping up to take up the slack left by Amy (Cub Convoy Coordinator and DCA intern), who has been stranded multiple times. There was even a birthday celebration at Plant City! The hope is that Cub Convoy might be able to be pushed back a day. We have 2 J3s in Baldwin, MS, and the 2 Super 18s in Decatur, so we could practically double the attendance if we could all make it, though that’s anyone’s guess. In any case, we’re looking forward to the dinner Tuesday night.